Small local TV Master Control Room. Satellite and Fiber optic incoming feeds. Fully digital HD and SD program delivery. Full local & remote control & monitoring. Plan facility from space allocation through completion. Workflow & overall systems design. Initial build to air in 2 weeks following disaster. 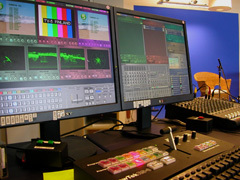 Medium flexible educational TV production facility. 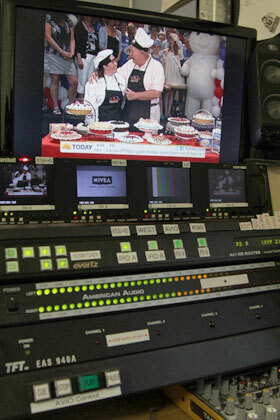 2 main cameras with TelePrompters & pedestals. Live & automated city-wide cable TV broadcast. Tapeless production environment across multiple classrooms. 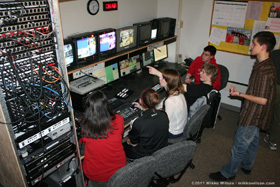 Remote live production in various areas of the school. Dedicated production links to gymnasium & auditorium. Full integration with theater communication system. 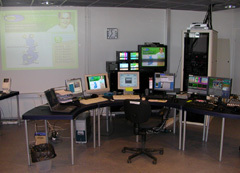 Small flexible educational TV production facility. Dedicated production links to auditorium, music studio, radio studio. Plan facility conversion during school renovation. 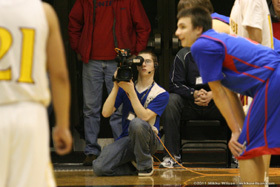 3 cameras in standard configuration. Remote live links to various areas of the school. National TV channel playout facility. Video system design & construction.